From a distance, you’d be able to see the majestic statue of Hanuman, set against the idyllic backdrop of the Kumaoni mountains. Instantly, you are drawn to the beauty and the aura of the place, and cannot help but feel the calming spiritual vibes. 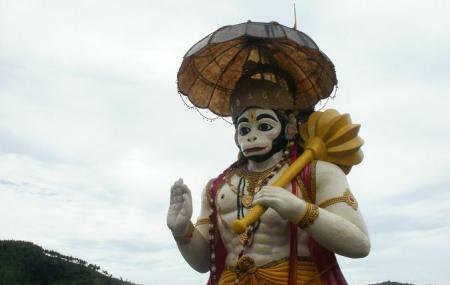 One of the key attractions of Bhimtal, the Hanuman Garhi is a temple dedicated to the monkey god, who was a devout worshipper of Lord Ram. Perched at a staggering height of around 6400 feet above sea level, the gigantic statue, the picturesque hills, the view of the deep valley below, all make this place truly enchanting!